It’s that time of the year again when exam revision and coursework deadlines leap to the top of your to-do list. 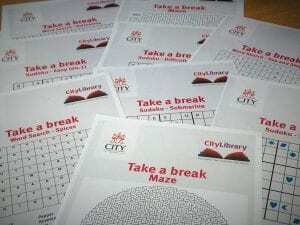 It’s also that time of year when Library Services launches our #TakeABreak campaign. #TakeABreak is about highlighting how taking proper care of yourself can help you achieve better results. That might mean making sure you take regular rest breaks, go for a walk, have a snack, distract yourself for 10 minutes, or leave early to get a good night’s sleep. Pushing yourself to achieve outstanding results shouldn’t mean compromising your health and wellbeing. 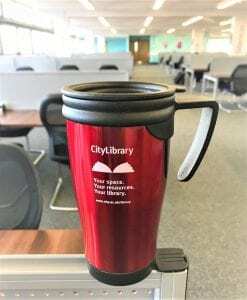 Over the next couple of weeks we’ll be highlighting a few tips and ideas to help you cope with what can often be a busy and stressful time of year, from reminders about our extended opening times to how you can book a study space; and watch out for our popular sudokus, puzzles, plus some fabulous freebies we’ll be giving away too. And remember, if you are feeling overwhelmed and need to talk to someone, there are lots of ways to get support here at City via the Student Union, Chaplaincy, Health Service and of course Library Staff. (When you do take a break from your studies, share your results on Instagram & Twitter #CityLibraryExams / #TakeABreak and let us know how you’re getting on).